A couple of weeks ago, I reviewed Steve Taravella’s new biography of Mary Wickes, subtitled I Know I’ve Seen That Face Before, on the blog. The book is filled with anecdotes about Wickes’ involvement with some of the biggest stars from the Golden Age of Hollywood: Lucille Ball, Bette Davis, Doris Day, Bing Crosby. But one name looms larger than most: Orson Welles. 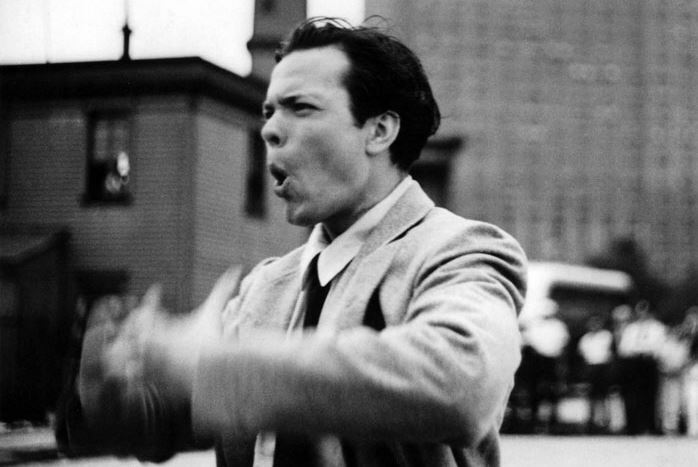 Welles directing the filming of TOO MUCH JOHNSON. Image courtesy of the NFPF. As Taravella recounts in the book, in 1937, Wickes was finishing a twenty-three week run as Little Mary in the Broadway production of Stage Door when Welles caught a performance of the play. By all accounts, he liked what he saw. When Welles began casting a production of Shoemakers’ Holiday with his Mercury Theatre troupe in December of that year, he sought Wickes out to play one of the roles. At the time, she was appearing in another Broadway show, Father Malachy’s Miracle, and turned down the part. But the following summer, when Welles had moved on to a new project, and Wickes’ run in Miracle had come to an end, the director again approached her to play a role, and this time she accepted. And that project? Too Much Johnson. “Unusual” might be an understatement. Making the production even more out-of-the-ordinary, Welles decided to film three segments of the storyline, comprised of a twenty-minute initial reel (which functions as a sort of prologue to begin the play before the actors appeared on stage) and two shorter reels, which were to be played before each of the two remaining acts. The filmed portions of the play are slapstick in nature, involving physical antics including a rooftop chase with Cotten dangling precariously above the streets of New York. Taravella mentions that, in later years, Welles claimed that these portions of the production were greatly influenced by the work of legendary silent comedian Harold Lloyd. 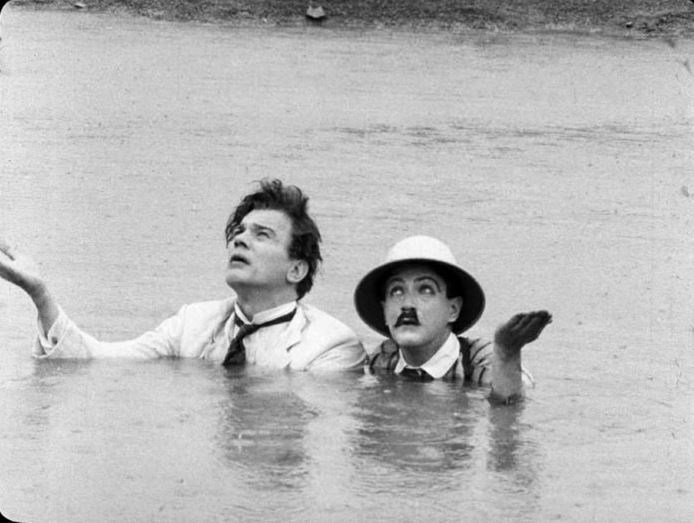 Joseph Cotten and Edgar Barrier in TOO MUCH JOHNSON. Image courtesy of the NFPF. If that wasn’t enough to sink the production, the financial woes put the final nail in the Johnson coffin. Welles, a notorious spendthrift, frequently traveled back and forth to New York (to do his Mercury Theatre radio series) by chauffeured limousine, and threw money away on little luxuries like expensive dinners. In the end, the show never made it to Broadway. The play closed after a mere two-week run. Furthermore, the production made no money, and because the Mercury could not pay for the negatives, Welles was unable to claim them. Multiple sources state that Welles possessed the only remaining print of the film, and that was believed to have burned in a fire in Welles’ Spanish home in 1970. 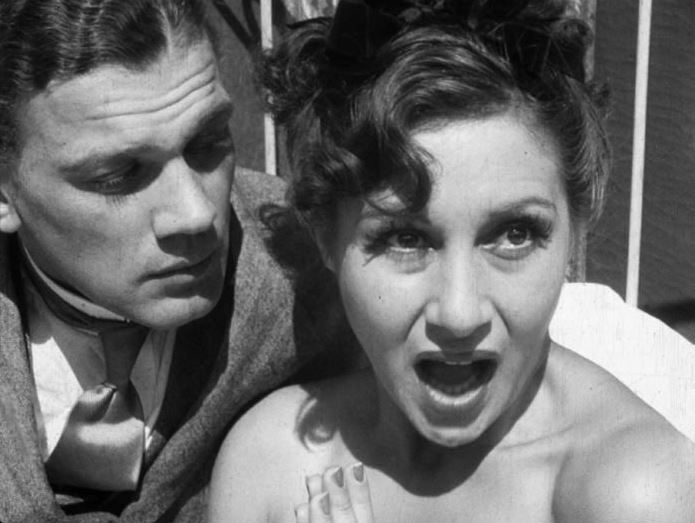 Joseph Cotten and Arlene Francis in TOO MUCH JOHNSON. Image courtesy of the NFPF. All things considered, the recent discovery of the lost Too Much Johnson footage in an Italian warehouse is a monumental find. The National Film Preservation Foundation announced today that the existing footage, which was preserved in conjunction with Eastman House, will premiere at the 32nd annual Le Giornate del Cinema Muto silent film festival in Pordenone, Italy, in October, followed a week later by an American premiere in Rochester, New York, at the George Eastman house. In the meantime, per the Self-Styled Siren, the NFPF is taking online donations in the hope that someday, sooner rather than later, Too Much Johnson can be made available for public viewing online. You can go here to donate. This is an unprecedented opportunity to see the rare, early work of one of (if not THE) most influential filmmakers in the history of cinema, so please consider kicking in a few dollars to contribute to future online screenings of the film. I don’t know about y’all, but I’m dying to see a Wellesian slapstick comedy–even (especially) one as seemingly disjointed as this one promises to be. I WILL DONATE A VITAL ORGAN FOR A CHANCE TO SEE A YOUNG JOSEPH COTTEN, LET ALONE TEN DOLLARS! !